To remove an engine out of the car safely, you will need to use a suitable engine hoist that will make it much easier and safer. Car engines can weigh over 500 LBS and without the correct equipment, you will find it relatively hard to remove the engine. The best engine hoist is the Dragway Tools 2 Ton Folding Hydraulic Engine Hoist that has a 4,000 LBS weight capacity and is a heavy duty construction. There are three different types of engine hoists for pulling out an engine and they include hydraulic, electric and chain. All of which have their own benefits and drawbacks that include weight capacity, ease of use and affordability. 7.1 What Are The Different Types of Engine Cranes? Trying to remove an engine without a hoist and using strong towing straps is possible but not worth all the stress and hassle. It is a big job that should be achieved with safety in mind and using the correct tools. Deciding on either a hydraulic, electric or chain hoist is dependent upon your budget and personal preference. All will easily assist with the job of removing an engine but a hydraulic or electric hoist will make it that much easier. Both hydraulic and electric hoists are fairly expensive but a worthwhile investment. For those on a budget, look towards the strong chain hoists that are very popular. Below is a list of the best engine hoists for removing engines from cars. Dragway Tools offer various engine hoists of all sizes and capabilities but the 2 Ton Folding Hydraulic Hoist is the best engine hoist for the money out of their range. Being a hydraulic engine crane, the lifting power of 2 ton is the limit, but it will probably be able to lift more at your own risk. Unlike other hoists, this model has been designed specifically for lifting engines from cars and has been tested against all scenarios. Other hoists are designed for all sorts of applications and may not be as simple to use for its intended purposes. The Dragway Tools Engine Crane is reasonable priced in the hydraulic lift market and unlike the competition at this price range, it folds down. This means it can be stored underneath parked cars or in the corner of the garage. The Five Oceans Electric engine hoist is by far the best electric engine hoist for the money with a total lifting weight of 2,200 LBS. The majority of electric hoists struggle at carrying 500 LBS and not 2,200 LBS as the Five Oceans. As it is an electric engine hoist, you have the added bonus of using a remote control for the lifting mechanism. This is perfect for lifting and guiding the engine out of the car at the same time without needing a second person for the removal. For peace of mind, this engine hoist comes with a 2 year warranty and a lifetime technical support. As it is electric, if there are any problems with the mechanism, you will be unable to lift anything, which may be a big issue. However, with the warranty, support and numerous standards that is met by this hoist, you can rest assure that it will work for many years. The Troin TR9020 is a premium chain hoist with different weight limits available depending on your budget. The weight capacities available include 1, 2, 3 and 5 tonne, which is a great variation that you can choose based upon your requirements. Torin is a reputable garage tools and equipment brand and the TR9020 is the best engine chain hoist available and will provide you with a simple solution for years to come. If you are dealing with large engines or other applications, the variety of weight capacities is a great option to have. A chain hoist is the cheapest crane/hoist that you can use to remove an engine from a car. It is an old fashion and simple design mechanism that provides a cheap yet efficient way of removing most engines. We recommend attaching this chain hoist to a secure ceiling or overhead beam that will be able to handle the weight. The steel chains are a 1/4 inch thick that provide a durable maintenance free method of lifting heavy objects. Overall the Black Bull CHOI1 offers excellent value for money and has been built to last. If you are after the the ultimate engine crane for removing an engine with ease, the Strongway is the best solution. Not only is this package a hydraulic hoist, it also features a load leveler which makes removing an engine even easier. With a weight capacity of 2 ton, the Strongway hydraulic crane can lower or remove engines and other heavy loads with ease. The working size is a rather large spread at 64 x 39 x 51 inches but if you are looking to store it, the hoist can be folded down to 28 x 29 x 60 inches. Overall, it is an excellent engine hoist that is built for maximum durability and ease of use. When it comes to using a hoist to remove an engine, there are various different types of hoists to choose from. These include a hydraulic, electric and chain hoist where each have their own benefits and drawbacks. Unless you are a professional mechanic, it may not be used that often therefore you may invest into an affordable engine hoist, which there are many. However, there are many excellent engine hoists that can make removing the motor far easier. What Are The Different Types of Engine Cranes? As mentioned, there are three different engine hoists that are hydraulic, electric and chain driven hoists. The most popular is the hydraulic chain for removing engines but of course, you can lift all sorts of heavy objects using these hoists. Using hydraulic cylinders, the liquid pulls the heavy object with ease using basic hydraulic properties. Similar to how brakes in a car work, using the liquid force to stop the car. The increase in hydraulic liquid pressure into the cylinder gives the hoist the power to lift. The hydraulic lift is the most efficient way of removing an engine from a car and is capable of lifting up to 5 tonnes in most cases. An electric hoist can not lift as much as a hydraulic hoist but it is much more easier to use. The majority of electric hoists will come with a remote that will allow you to control the pulling. This is great if you are the only person lifting the engine from the car. You are able to guide the engine and use the remote at the same time. Electric hoist are great for lifting smaller engines as it can usually only hold between 300 to 500 KG of weight at a push. The most simplest design consisting of an axle, cog and sprocket in order to lift heavy objects. In return for manual and slower lifting process, the chain hoist provides a relatively cheap alternative to lifting heavy objects reliably. Mid range chain hoists can easily lift 2 tonne and if you increased your budget further, they could lift over 5 tonne. They are perfect for lifting engines from cars (such as my engine removal in the photos) and pretty much need zero maintenance. 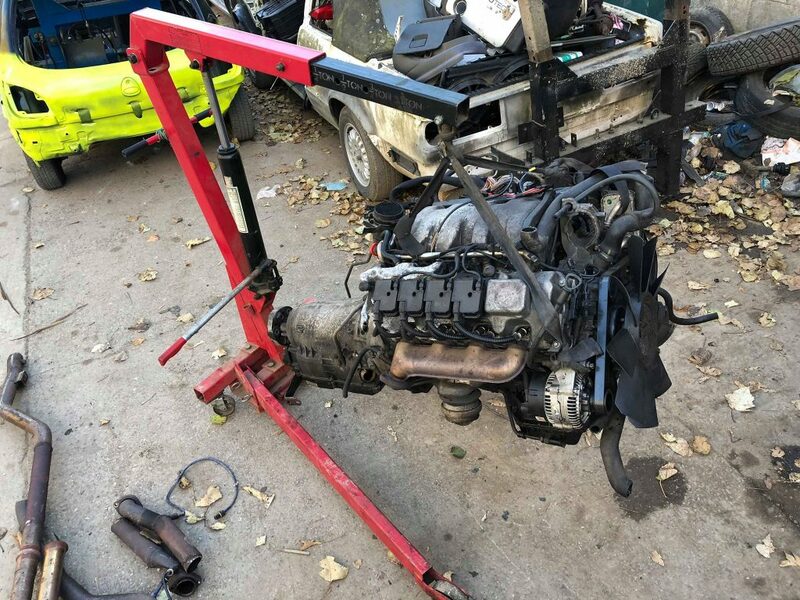 Removing an engine from a car is not as simple as connecting a hook and ripping it out. Before you get to that part, preparation will be required so that all goes to plan with no mess or damage. For precaution, we advise disconnecting the battery and removing the bonnet so that there is more room to work with. It also helps having bright LED garage lights to help you see every nut and bolt as well as the hoist being connected correctly. Empty Fluids From Engine. As if you were changing the oil, start by removing the oil and after that remove the coolant via the radiator peacock. Remember that coolant may still drip from the hoses. Disconnect the Coolant Lines. The hoses will be connecting from the radiator to the engine and these will need to be removed. Disconnect the Exhaust and Intake. The intake will be connecting from the air filter to throttle body. To remove the exhaust, remove the bolts at the bottom of the exhaust manifold. Remove Connected Wiring. The age of your car will determine how much wiring there will be. Remove all wiring that you can see connected to the engine. Pull Apart Transmission and Engine. Place a floor jack under the transmission and then start unbolting the bolts that pass the bell housing of the transmission into the engine. Be advised that the transmission will drop once the bolts are removed and the jack will hold the weight. Disconnect Engine Mounts. Use a wrench to remove the bolt holding the mount to the engine. Connect Chain to Mounting Area. It should be pretty clear where to loop the chain but if it isn’t, check the owners manual for your car. Lift Engine with Crane/Hoist. It is advised to have an extra pair of hands for this part. Have one person to slowly pull the engine up using the crane and the other person guiding the engine out of the car without damaging the bay area. 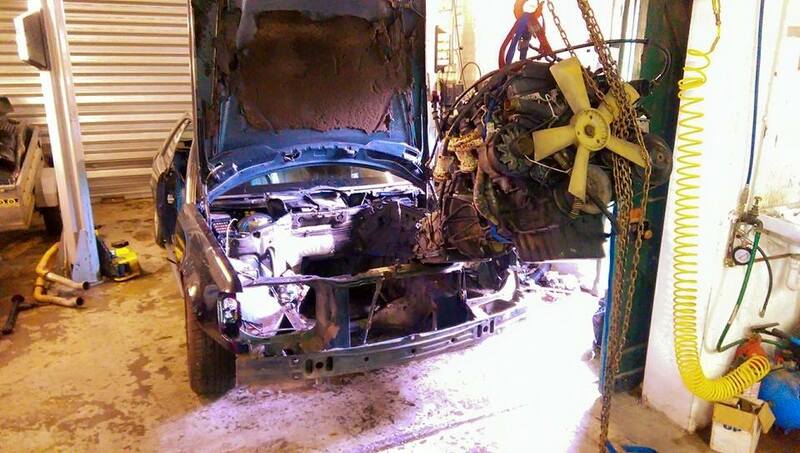 Removing an engine from the car is not the hardest thing in the world. That being said, it is much easier to remove an engine from an older car than it is the modern cars. A word of advice, if you are replacing the engine be extra careful with the fuel lines and electric cables. These can be brittle and break easily, which can be hard to diagnose when your new engine is not starting. 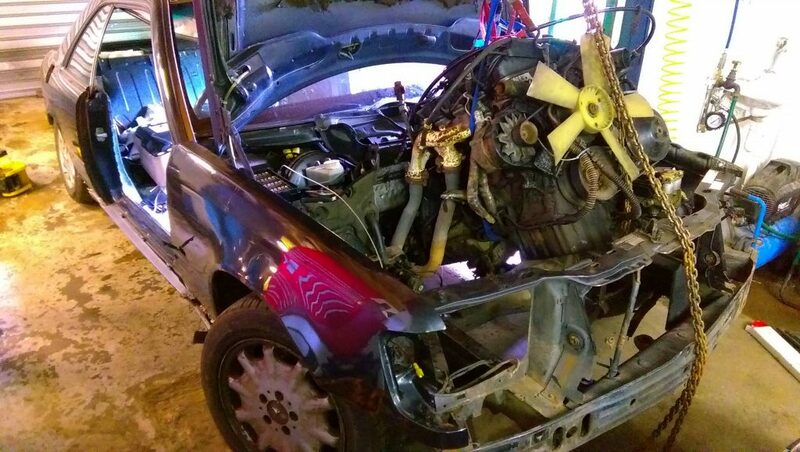 When removing an engine from a vehicle, you are more than likely going to have to move it around. You could place the engine on some heavy duty car dollies but a hoist with wheels can make a huge difference. For example, we recently removed a V8 Mercedes engine and placed it inside a utility trailer using the hydraulic engine hoist in the image below. This makes things far easier than having to drag the engine around on the floor and then lift it back up into the trailer. It is possible to remove an engine with no hoist or crane. It involves getting the car high up in the air via axle stands, which gives you an idea of where this is going. Following the disconnecting of the above guide, you will then need to place the jack under the oil pan. You may need to increase the height of the jack with a meaty blank of wood in order to reach the oil pan (whilst on axle stands). You will need to jack the oil pan up until the engine is no longer on the mounts. At this point, you can unbolt the mounts. If you own a fully functioning two post or four post car lift, it may be easier to replace the engine on the lift than using axle stands and a low entry floor jack. You are now able to slowly lower the jack whilst checking everything has been disconnected. Once the jack is at the bottom, you will then need to drag the engine from below the car. This is not an easy job and this is the reason why engine cranes were invented. Depending upon your personal circumstances, you may decide to purchase two different types of engine hoists. For example, if you have a garage, you may opt to use a chain engine hoist. However, you may want to remove an engine from a car that is not within a garage and this is where the alternatives such as the Dragway hoist is the best option. Within this article, we have covered every type of engine hoist and depending upon your budget, you may add various additional extras.